Tackling anti-social behaviour is critical to building public confidence and if not tackled can blight the lives of people living within communities. Dealing with anti-social behaviour remains a key priority for us. West Yorkshire Police works in partnership with local authorities and is increasingly the involvement of our communities to tackle priorities that are associated with anti-social behaviour. We have recognised the need for Neighbourhood Policing to be closely integrated with Neighbourhood Management to seek long term solutions to anti-social problems. This has resulted in success and a continued determination to make use of the extensive powers to make neighbourhoods safer. The raft of tools and powers available to us to deal with anti-social behaviour, include Warning Letters, Acceptable Behaviour Contracts (ABCs), Anti-Social Behaviour Orders (ASBOs), Premises Closures and Dispersal Orders to name but a few. Our response to anti-social behaviour is based on the scale and persistence of a particular issue, providing help to those members of the community whose lives are affected by the problem and with a focus on supporting those victims who are more vulnerable. There are now dedicated anti-social behaviour teams within districts across West Yorkshire, made up of police, local authorities and partners. These teams deal with the more serious and recurring problems, providing support and expertise to complement the work of local officers. The number of anti-social behaviour incidents reported to the police has fallen in West Yorkshire. 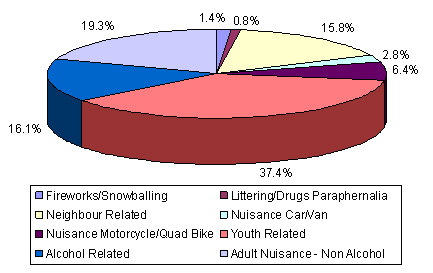 And fewer people now believe that anti-social behaviour is a problem in their local area.